At their best, memoirists address the struggles and controversies of our world in a way that reaches out to readers and says: You’re not alone. The collection is edited by Meredith Maran, an author, book critic and journalist. She’s published a few memoirs of her own, including What it’s Like to Live Now and My Lie. This collection is a follow up to her 2010 anthology Why We Write. Twenty writers explore why they write memoir, how much they choose to reveal about themselves and others, and how it feels to share their most personal stories with the public. Reading personal essays and memoirs and want to write your own. Ishmael Beah, Kate Christensen, Pearl Cleage, Pat Conroy, Kelly Corrigan, Edwidge Danticat, Meghan Daum, Nick Flynn, A.M. Holmes, Sue Monk Kidd, Anne Lamott, Sandra Tsing Loh, James McBride, Dani Shapiro, David Sheff, Darin Strauss, Cheryl Strayed, Ayelet Waldman, Jesmyn Ward, Edmund White. Each writer speaking documentary-style from their favorite place to write. In the land of writing about my life? It happens sometimes. If I were a painter, I would have found some way to paint a series of painting about that year. If I were a musician, I would have written a piece of music. If I were a dancer, I would have choreographed something. But since I’m a writer, this was the only place I could go to. Writers who get personal often get dismissed as self-absorbed. As this collection points out, memoir writing isn’t really an ego thing. It can be a form of release, but it can also hurt like hell. At their best, memoirists address the struggles and controversies of our world in a way that reaches out to readers and says: You’re not alone. 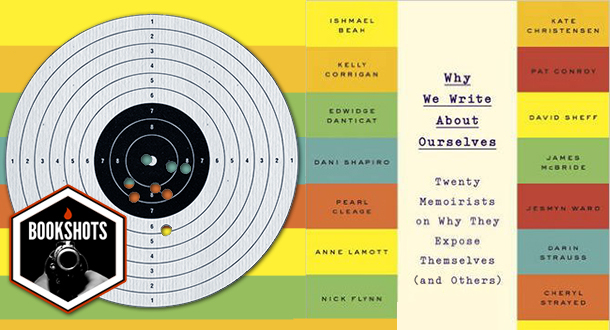 Why We Write About Ourselves is an anthology that comes out of the blog era. Each chapter is formatted similarly: an author bio, a “Why I write about myself” heading, and then each authors’ approaches to writing about family, prejudice, politics, and their own flaws, all while choosing how to frame their stories. Each writer agrees: it’s hard to make it look easy. This is a great collection for people who write personal stories or have always wanted to, but don’t know where to start. It’s inspiring to hear experts get at the heart of what guides their work. Why We Write About Ourselves reads like the ultimate guest lecture series. Not every writer agrees on how to address writing about others, which is comforting. Some won’t share anything without permission, others write like everyone they know is dead. Some change names and leave out certain details to avoid hurting people. Even with the best intentions, though, it’s impossible to know exactly where the landmines will be. Memoir at its strongest isn’t written with the intention to burn others. Writers share their most personal moments to immerse readers in a different experience, to bring strangers to what Ralph Waldo Emerson calls “the common heart.” Memoir should get that heart beating.